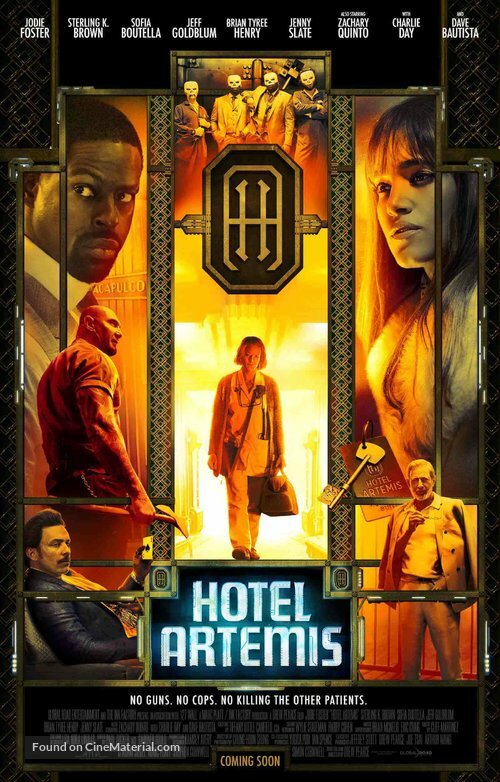 To put it simple, Hotel Artemis is a mediocre action movie with a sci-fi edge to it. It has a great cast with characters wasted on bad writing. The idea of the movie is interesting, but the story is pretty weak. It’s not a movie I’d recommend to anyone unless you have a free pass and you’re bored. The premise of the movie is that Jodie Foster (The Nurse, though at some point in the movie they do say her name) runs a secret hospital for criminals that’s located in an old hotel. To check-in to a room and get medical services, you have to have a membership and you have to obey the rules. Dave Bautista plays Everest, the orderly in the hotel and the Nurse’s only assistant. Everyone else in the movie is a criminal. It kicks off with Sterling K. Brown leading a crew that robs a bank. They get shot up and head to the hotel. From there, we get introduced to the hotel, how it works, some sci-fi medicine that includes 3D printed organs, and the other characters. Sofia Boutella plays a contract killer who has contacts that allow her employer to watch the kill. Charlie Day plays a really annoying arms dealer who is written into an unlikable position. Jeff Goldblum plays the big kingpin, and Zachary Quinto is his son, who is unfortunately a very shallow character. Really, all of the characters are shallow. There’s not a lot of depth to them. The Nurse gets most of the character development, and the story just devolves into everyone killing each other. The movie written and directed by Drew Pearce, so it’s pretty easy to lay the blame at his feet. On the positive side, it’s not a complete waste of time. It’s somewhat enjoyable. Some of the characters are likable, and Foster, Bautista and Goldblum all did good jobs. With some better writing, this movie could have been a lot better. As is, it’s okay. Not worth a $10 movie ticket, but if it hits Netflix, it would be worth a watch. I give it a two out of five metal bikinis.